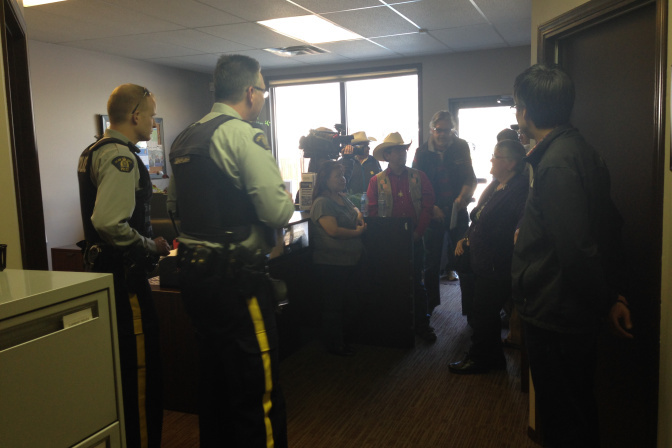 A group of about 25 people including chiefs representing Nicola Valley First Nations are occupying the Kelowna office of BC Premier Christy Clark. They are protesting a contentious proposal to truck in and dump treated bio-waste on to local farmer’s fields as compost. “Trucking thousands of tons of sewage treatment waste to be spread onto our farms, ranches and forests is not healthy for our lands,” the chiefs said in a statement. The chiefs, who are demanding an immediate moratorium on the importation of biosolids into the Nicola Valley, say they plan to camp out indefinitely until their demands are addressed. Last month, protesters opposed to the plan blocked a section of Highway 8 leading to the biowaste composting facility near Merritt. 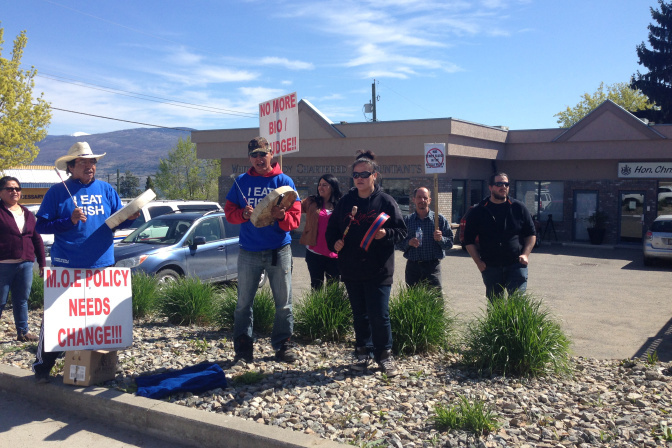 Nicola Valley First Nation chiefs are occupying Premier Christy Clark’s West Kelowna constituency office in protest over the trucking of sewage sludge from the Central Okanagan to land near Merritt. The five chiefs represent the Upper Nicola, Nooaitch, Lower Nicola, Shackan and Coldwater Indian bands. They are Chief Harvey McLeod, Chief Marcel Shackelly, Chief Aaron Sam, Chief Percy Joe and Chief Lee Spahan, and are joined by members of the group Friends of the Nicola Valley. They say inaction by the province on the issue of importing sewer sludge into the Nicola Valley led them to take action. “The Nicola Valley First Nations hold and exercise aboriginal title and rights over areas where biowaste operations are currently being carried out, and where future biowaste operations have been proposed,” group says in a press release. “The biowaste operations affect our aboriginal title and rights. The province of British Columbia is obligated to consult and accommodate us in relation to the impacts of biowaste operations on our rights and title,” said Chief Sam. “We are unified in our mission to stop this toxic waste coming into the Nicola Valley area. We take care of our own sewage and expect other municipalities to do the same. The group is demanding an immediate moratorium on the importation of biosolids to their region. Castanet has a reporter on the scene, and we will have more details shortly. Posted on April 15, 2015, in Defending Territory and tagged biowaste, Native occupation, native protests, Nicola Valley First Nations, Premier Christy Clark, sewage sludge. Bookmark the permalink. 2 Comments.